Lyrical is a plugin to sing song lyrics. It can also be used to recite tales or poems. Store unlimited songs and switch between them easily, and recite lines by clicking a single button. 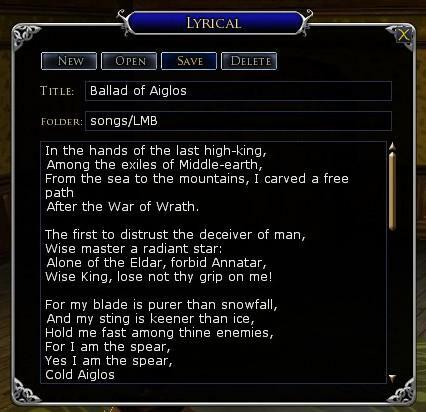 Unzip the zipfile and place the "Astleigh" folder your Documents\"The Lord of the Rings Online\Plugins" folder. Click "New" and enter your lyrics or text into the edit box. You can optionally type a category in "Folder" to organize your lyrics. Nested folders are supported by using a slash character (e.g., "songs/Tolkien"). Click "Save" when you are done editing. Clicking the quickslot button at the bottom of the window will /say the highlighted line and automatically advance to the next line. You can select any line by clicking on it. You can load songs by clicking the "Open" button and selecting the song title from the menu. Written by Astleigh Mondegreen <astleigh.mondegreen@gmail.com >. Some code is borrowed from Emo by Scott Powers and Songbook by Chiran. Thank you to these authors for their work, without which Lyrical would not have been possible. This should fix loading errors with "unable to resolve Turbine.Utils." This is free software. There is NO warranty; not even for MERCHANTABILITY or FITNESS FOR A PARTICULAR PURPOSE. This plugin is released into the Public Domain. Period. Use it however you would like. Attribution would be nice, but is not necessary. Last edited by Astleigh; Jul 10 2012 at 01:09 AM. Version 1.4 of Lyrical has been released which should fix problems saving data for European users. Thanks to Glenwin (Belegaer DE-RP) for suggesting a fix and testing it. For non-EU users, if you update to 1.4, you will need to delete your existing Lyrical.plugindata since the save file format changed. Lyrical 1.5 has been released. I squashed a bug that had been reported for several months, where song data was not being saved. The issue was caused by other plugins interfering with Lyrical due to a bug in the code. If you were affected by this, I'm really sorry! I'm really sorry, but I introduced another bug with version 1.5. If you don't have the Turbine plugins installed, loading will fail. I released 1.6 to fix this. Lyrical 2.0 has been released. * You can add titles to your songs, and open songs quickly from a popup menu. 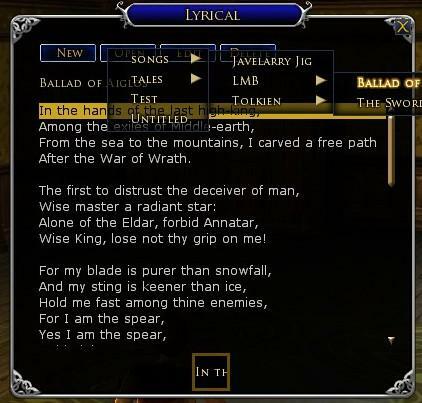 * The lyrics display now scrolls with the currently active line. Those are some exciting changes to an already magnificent plugin. Thank yer for yer continued work on this! Regarding the popup menu: I have about 90 songs/poems and the likes in me lyrical. In version 2.0, this is too many songs for the popup menu, so the upper half of my song list won't show on my screen. The problem is that I can't find any way to scroll up and down the menu, and with the browse buttons gone too... So I have reverted back to 1.6 for the time being. Is there any way to show all songs in very long song lists? I had no idea anyone was storing that many songs! The Lyrical 2.0 design was prompted by requests from users who had 20-30 songs, and wanted a faster way to open songs without using the scroll buttons. I don't know of any way to scroll popup menus, but I was planning to add folders which would let you access a larger number of songs than would fit in one menu. So the short answer is you'll have to use 1.6 for now, but a future release of Lyrical will let you access all 90 songs. Looking forward to future updates! The folders sound like a good idea! Lyrical 2.1 has been released. * Added support for organizing lyrics by folder. Ein Zwerg ist ein Zwerg, ist ein Zwerg, ist ein Zwerg! Thanks for letting me know it was bugged in the EU client. It was not difficult to fix, though it took me a while to figure out I needed to type "zusatzmodule laden lyrical" to load plugins in German. Please try 2.2 and let me know if that fixes it for you! Did I erase the songs/stories I had in lyrical or is the script just not finding the info? Can anyone tell me how I can fix this, please? I am lost without my Lyrical!! It sounds like you found a new bug. Would you mind sending me a copy of your lyrical.plugindata file? I'll see if I can figure out what went wrong. In the mean time, you could try backing up your existing lyrical.plugindata, deleting the old one from the plugindata folder, and restarting lyrical. You'll have to recreate all the songs, but at least it shouldn't be bugged any more.